Pardon this Vox-like deep chart-dive, produced of course without Vox’s actual chops in this area. Illinois attracts national attention because we are now enmeshed in a political and budgetary standoff between our Republican Governor Bruce Rauner and the Democratic legislative majority. It is a governance disaster.Â It has deeply damaged public services, along with our state’s bond rating and national reputation.Â We are now running large budget deficits caused by our unduly low and flat income tax, which is 11th lowest in among taxing states, and our chronically under-funded public employee retirement systems, whose bills are coming due. Of more immediate import, we have had no state budget since July 1, 2015. We may not have one for the next fiscal year, either. Money still flows through Medicaid. Our embarrassing array of court-supervised services are still being funded. Outside of that, though, many other services are being seriously harmed.Nonprofits with strong fiscal reserves soldier on.Â Illinois owes Catholic Charities $25 million, for example. MarquisÂ nonprofit and social service agencies have cut services or are simply closing. Â The layoff notices sent to every employee of Chicago State UniversityÂ and the currentÂ nonpayment of promised state financial aid to 130,000 college students exemplify the harm to students and staff at important institutions of higher education who are injured bystanders in the continuing political standoff. To resolve the current standoff, what must happen is as clear as the two-state solution in the Middle-East, and seemingly as difficult to achieve. Both parties need some dignified path to at least a normal interim budget.Â Illinois desperately needs a progressive tax increase. We must remove everyÂ fiscal policy provision and constraint from ourÂ state constitution. We must impose a higher level of professionalism and fiscal transparency within ourÂ broken state politics that have lost both theirÂ effectiveness and theirÂ public legitimacy. Less well known are the serious challenges Illinois has faced since well before the current fiscal crisis. We have long ranked near the bottom in national rankings of intellectual disability services. In 2015, United Cerebral Palsy’s “Case for Inclusion” ranked Illinois 47th in the nation in the quality of state Medicaid services for individuals and families in the arena of intellectual and developmental disabilitiesÂ (IDD). In many ways, we are slipping further behind. I recently delivered an intellectual disability lecture at Lurie Hospital on Chicagoâ€™s north side. I heard about parents of children with special needs who are leaving the area. I heard stories of successful professionals moving just across the Wisconsin border and commuting to the Loop. As a caregiver myself for someone with fragile X syndrome, I certainly sympathize with these choices.Â When my brother-in-law Vincent moved in with us in 2004, we were rescued by critical programs that have since been ended or curtailed. If he joined us today, we would face far longer waiting lists and would receive much more limited help. Although I love the opportunities and collegialityÂ at the University of Chicago–and notwithstanding my low state income tax bill–I often wonder whether we should have left Illinois for a state that offers better services. Consider the below charts, all but one of which are taken from the unique resource, State of the States in Intellectual and Developmental Disabilities. And remember, these data stop in 2013, well before Illinois’Â current budget crisis. The first graph shows inflation-adjusted public spending on intellectual and developmental disability services across the nation. The graph shows remarkable and steady growth, roughly 7.99 percent above inflation since 1977, driven by Medicaid. 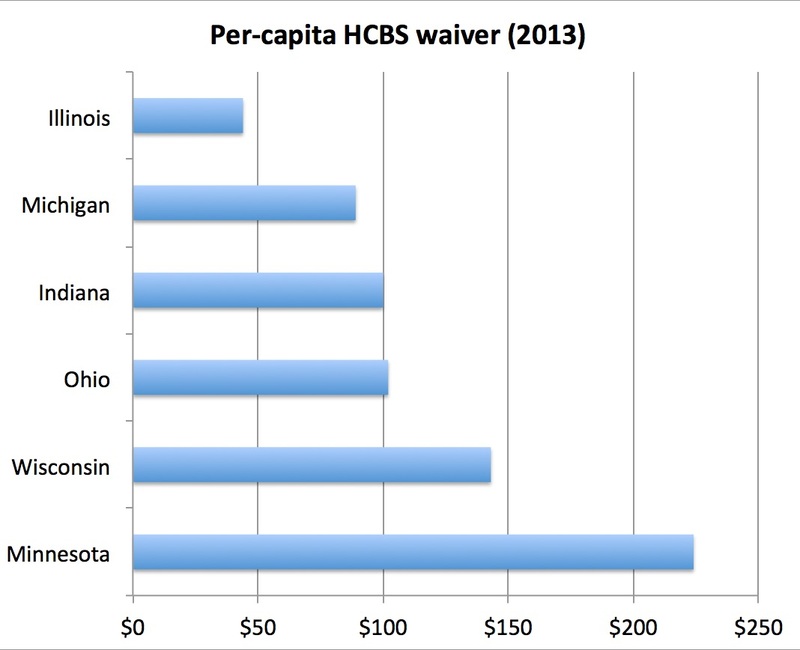 Below is the corresponding graph for Illinois. As you can see, state expenditures peaked inÂ 2002, and have notably declined since then. Below are the corresponding figures for â€œfiscal effortâ€â€”that is, spending per $1,000 in personal income. By this measure, too, Illinois is far below other states. Illinois underspends particularly egregiously on home and community-based services–even compared with our Red State neighbors. 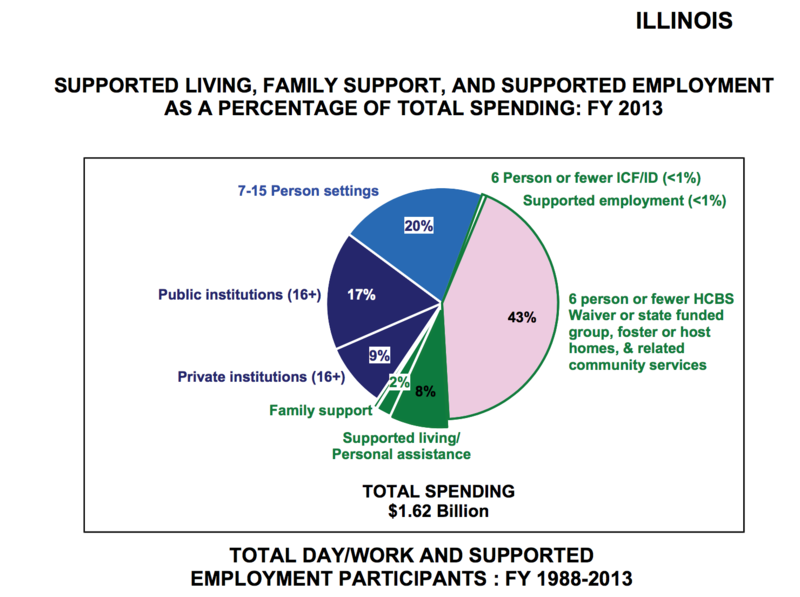 The two charts above show that Illinois lags especially far behind in the arena of home and community-based services, where we spend barely half the national average as a percentage of our state income. We lag far behind our neighbors, too. It’s not a Blue vs. Red state thing, either. Some of our midwestern peers, such as Minnesota, are reliably liberal. Indiana, Ohio, and Wisconsin have prominent conservative governors. Each of these states spends at least twice as much per-capita as we do. Over the past forty years, states have sought to reduce their reliance on institution-based care. Most individuals with intellectual or developmental disabilities live much better on a smaller scale, in their family homes or in smaller, community-based group homes more formally known as CILAs [Community Integrated Living Arrangements]. 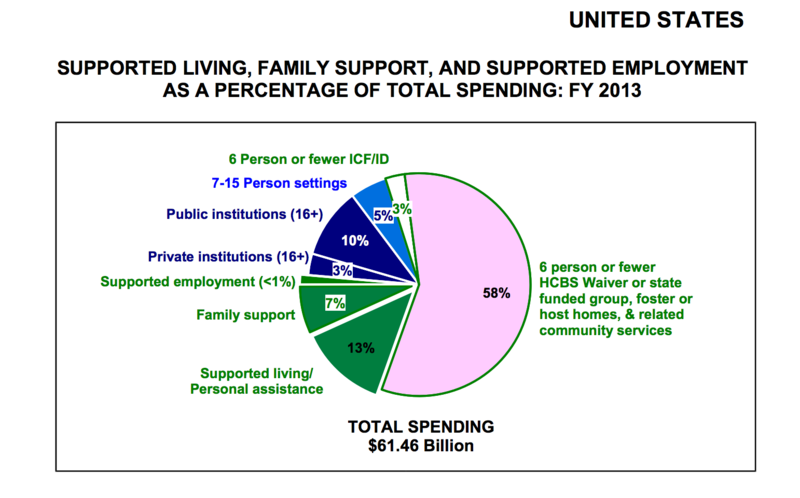 As shown above, only about 18% of national IDD spending is for public or private institutions, or for living arrangements of seven individuals or more. Despite real progress accelerated by lawsuits and judicial decrees, Illinois remains unusually dependent on institutional and large-facility-based care. As you can see below, Illinois spends about 46% of its IDD expenditures onÂ public or private institutions housing seven or more. Opportunities for supported employment has been a godsend for Vincent and for our entire family. 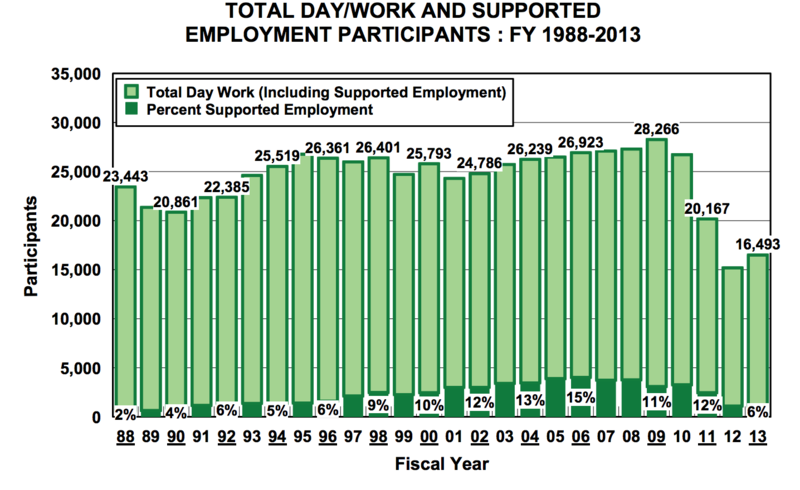 The national trend shows steadily increasing participation in supported employment and day work. For reasons I don’t fully understand, participation and supports in day work have plummeted since 2009. By 2013, the number of participants was well below the levels of 1988, thirty-seven percent below the number of placements available when Vincent joined us twelve years ago. Low wages and budgetary pressures are key drivers of these problems. Ronnie Cohn, a Court-appointed monitor for IDD services in Illinois, released a January 2016 report detailing challenges to the care system. Leaving aside issues created by the budget crisis, Cohn noted the harmful impact of long-term trends.Â It’s especially galling that IDD providers compete with such mixed success with fast-food restaurants and other low-wage employers. Individuals and families then wait for services because local Â providers cannot hire and retain adequately staff to meet service needs. Low wages [are] creating a staffing crisis for providers of all types of services. .
Chicago-based agencies are struggling to remain competitive with other employers in the area due to the city-wide minimum wage increase to $10.00 per hour effective July 1, 2015, with no commensurate increase in reimbursement rates. Cohn’s findings are consistent with other data. In one recent IDD provider survey conducted by the Institute on Public Policy for People with Disabilities, the average annual turnover rate among direct service staff was 30.3%. Â Average hourly wages remained below $10. Forty-five percent of DSPs rely on some form of public benefits, despite full-time employment. Between 2003 and 2013, adjusted median hourly wages for Illinois DSP staff rose from $9.28 to $10.18. Corrected for inflation, this amounts to a 13% pay cut. The scaryÂ part is that IDD services are in better shape than many other social services in Illinois. Illinois’s chronic bipartisan governance failures have produced a terribleÂ situation for people who live with intellectual disabilities and for their families.Â The really frightening part is that IDD services are in better shape than many other social services in Illinois. IDD services have also fared better than others during our current budget crisis. IDDÂ services are court-monitored, and the IDD community is much more sympathetic and more politically organized than many others in equal need ofÂ help. One way or the other, Illinois will resolve its current budgetary standoff. I hope this producesÂ long-term reforms.Â Every major stakeholder, political party, and interest group has contributed to our state’s governance failures. Every one of them must give up something to fix it.Â We cannot operate a state government with poor long-term fiscal planning and oversight, blue-state expectations for service delivery, and red-state expectations for low and flat state income taxes.Â In my twenty-five year career in public policy, I’ve never seen anything quite like this.